A team of engineers within the Applied Electromagnetics Group at the University of California San Diego have developed what they are calling the first semiconductor-free, optically-controlled microelectronic device. Translation – they’ve essentially created modern-day vacuum tube technology in nanoscale that could possibly replace the speed, wavelength and power handling of microelectronics beyond what is possible with today’s semiconductors. The problem with semiconductors, the team highlights, is that they can impose limits on a device’s conductivity (electron flow). They also have a band gap meaning they require a boost of external energy to get electrons flowing through them. Because electrons are constantly colliding with atoms as they flow through the semiconductor, electron velocity is limited. The engineering team wanted to remove this roadblock by replacing semiconductors with free electrons in space at the microscale. Doing so, however, requires either applying high voltages (a minimum of 100 volts), high-power lasers or extremely high temperatures (over 1,000° F) – none of which are practical in micro or nanoscale electronic devices. To circumvent the challenge, the team fabricated a metasurface on top of a silicon wafer with a layer of silicon dioxide between the two. 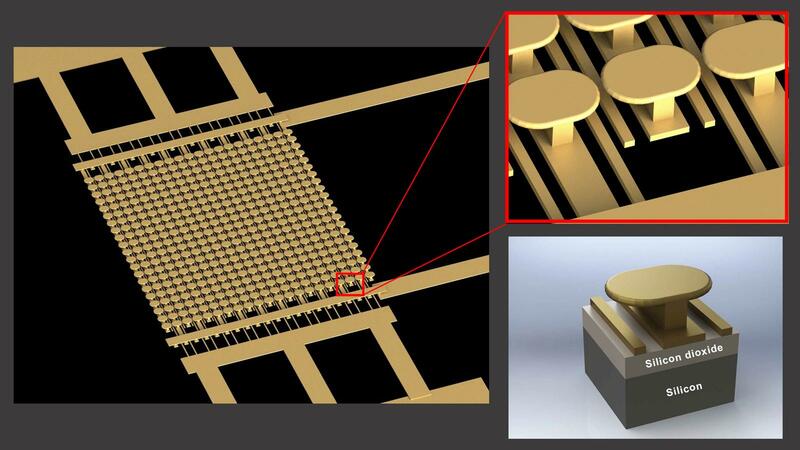 The metasurface is unique in that it consists of an array of gold mushroom-like nanostructures on an array of parallel gold strips. By applying a low DC voltage (less than 10 volts) and a low power infrared laser to the metasurface, it creates high-intensity electric fields that can free electrons in space. Ebrahim Forati, a former postdoctoral researcher and first author of the study, said the proof-of-concept metasurface has exhibited a 1,000 percent change in conductivity in testing which means more available electrons for manipulation. Team lead and electrical engineering professor Dan Sievenpiper said the method won’t replace all semiconductor devices but it might be the best approach for specialty applications such as those that require high amounts of power or those that operate at very high frequencies. The next step, he said, is to understand how far the devices can be scaled and the limits of their performance.